ConservativeHome.com's coverage of everyday Tory events now continues here on the ToryDiary. This blog will remain live as a comprehensive archive of the leadership race but new posts will not be added to it. This extended post is based on interviews with senior MPs and advisers to each of the main leadership camps. Few of the friends that contemplated David Cameron’s leadership bid expected anything other than a Davis victory. Their hearts wanted ‘Dave’ to win but their heads told them that 2005 was really about positioning for another battle, four or five years’ time. There were times when some friends almost threw in the towel. Cheerleaders at The Times lost heart in the middle of September and used a leader column to suggest that it might soon be wise to team up with a bigger beast. Simultaneously some of Cameron’s closest lieutenants were complaining about their candidate’s unwillingness to take risks. David Cameron’s leadership hopes were transformed just days later. Two compelling performances – first at his campaign launch and then the now famous Blackpool speech – transformed his public standing. He was no longer the little boat at the mercy of powerful currents and the swell of larger craft; he was the supertanker candidate on course for victory. But Mr Cameron was far from being the sole architect of his victory. Michael Howard and David Davis also played very considerable roles. A few days before May 5th’s General Election Michael Howard learnt that supporters of David Davis were beginning to collect the signatures that would trigger a parliamentary vote of no-confidence. If he hadn’t resigned by the weekend after polling day, the Sunday newspapers would be full of talk of an impending challenge to his leadership. ConservativeHome.com's review of the leadership contest will be posted on this site at 10pm. A new 'Everything Conservative' site will be launched tomorrow. In third place are the newspapers. This wasn't a good contest for them. The Telegraph followed opinion in the Tory party. It didn't lead it. It only endorsed Mr Cameron after it was clear he had already won. The Mail tried to get Ken Clarke elected and failed. It also failed to ignite the drugs row. The Sun was peripheral. The right-wing press never got their act together in this election contest and are unlikely to be as feared/ respected/ as influential ever again. In second place I'm going to award the internet. I think this site and other bloggers have often been ahead of the newspapers but, much more importantly, have been the pollsters and YouGov, the internet pollster, in particular. I'll publish the full results of ConservativeDemocracy.com's survey soon (you can still take part by the way) but the lead reason for people voting for Mr Cameron was that they thought he was popular with the public. The Davis team were reportedly devastated by the YouGov poll of the weekend after conference which showed such a big swing to Mr Cameron. In first place I'm awarding Nick Robinson, BBC's Political Editor, and Tom Bradby, his successor at ITN. Bradby, in particular, led the reporting of DD's conference speech. It bombed and it bombed badly he told the public (anh interpretation that still infuriates the Davis-ites). These two talking heads - and the production/editorial teams behind them - had big influences on this contest and will continue to be very big players in politics for the next few years (at least until the blogosphere really hits its potential heights). PS Iain Dale, Chief of Staff to DD, has posted that camp's own awards results here. IDS gets his third of the award for being ahead of his time. During his curtailed leadership he said that the party must become the champion of the vulnerable. It was a theme that few understood at first and which his successor largely abandoned. But all of this contest's participants spoke at his Centre for Social Justice (in which I must declare an involvement) and David Cameron's big theme is 'modern compassionate conservatism'. Michael Howard shares the award because he oversaw a lengthy leadership process which has given the party new heart. There wasn't a rush to elect a leader as many Tory MPs had demanded. What has resulted is a very creative process at the end of which pollsters have found that the public thinks that we are more united than Labour. That hasn't been true for a very long time. I'm in a generous mood today and so am going to overlook the fact that this lengthy process is at least as much by accident as design. Michael Howard engineered the length of process by trying to take the vote away from members. He failed in that attempt but we'll forgive him given the new spirit of party unity. This is a pretty lean awards category. David Cameron, in particular, largely eschewed detailed policy ideas - preferring grand themes. When it came to policy he chose the reverse gear - on tuition fees and the patients passport, for example. David Davis had a few ideas but they hardly captured the public imagination. Leaving the EPP was clearly the most controversial policy idea and I'll give it third place. I'm not entirely sure if it qualifies as a policy, however. You can see how hard this category is. Joint second place will go to George Osborne and his belief in flatter taxation. He has set up a committee that will report in due course... Mr Osborne can share second place with David Davis' growth rule - an approach that would have cut taxes by £38bn over the course of a parliament. First place must go to David Cameron's phonics policy - already accepted by the besieged Ruth Kelly. Fast work, Mr Cameron. This really is government by proxy and will help tens of thousands of children to read. This new survey is now live at ConservativeDemocracy.com. It will produce a clear picture of why people voted for David Davis or David Cameron. It will also help us to understand party members and supporters' expectations of the incoming leader. Please vote now and encourage your Conservative friends to join this monthly panel of Conservative opinion. This is the one awards category where the Davis-ites sweep the board. In third place is Mr Davis himself with his wristband generation speech. 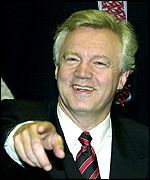 Some visitors to this site were a bit sniffy about the idea but Davis (and IDS who originally provided the idea) know that people don't vote out of crude interest alone; they vote for a party that is 'good for them and for their neighbour'. The party must pass what David Davis called the Decency Test. DC certainly passes it but DD put it very well. In second place is Paul Goodman MP's recent Platform blog. Mr Goodman suggested that the Tories - led by Mr Cameron - might rejoin the establishment. Mr Cameron certainly seems to be inching much closer to the establishment's views on issues like the environment, taxation and civil liberties. Some of us don't welcome that and will be vigilant against it. "If I became leader of this party I wouldn’t spend half of this parliament setting up commissions. I already know what I believe. I believe today what I believed six months ago. I believed six months ago what I believed five years ago. I know that Britain’s economy needs lower and simpler taxes and the first budget of the next Conservative government must begin to deliver them... And I know that free trade, good governance and property rights are the key to progress in the third world. I will spend all of this parliament explaining those beliefs to the British people. Some of them may not look popular now but time and the facts are on our side. This parliament is still young. I have the determination to spend the whole of this parliament selling an authentic, socially-just conservatism to the British people. In the last two parliaments our policies became as timid as the limited time we gave ourselves to sell them. There will be serious policy development under my leadership but I’m not willing to spend three years in a policy vacuum – and spent one year filling it. Our main policy priorities need to be communicated and explained now. The role of free trade in making poverty history will be a top priority." On the Patients Passport and tax Mr Cameron has sometimes appeared reluctant to sell difficult ideas to the British public. I hope Mr Cameron's leadership won't be characterised by Major-like caution. We'll soon see.